The last time I was properly in Hong Kong was way back in 2013, and by chance I also happened to be there during another "Rice" run, when I was able to try the Rice Fun Tastic Wrap and the Beef Karubi Rice Bowl. 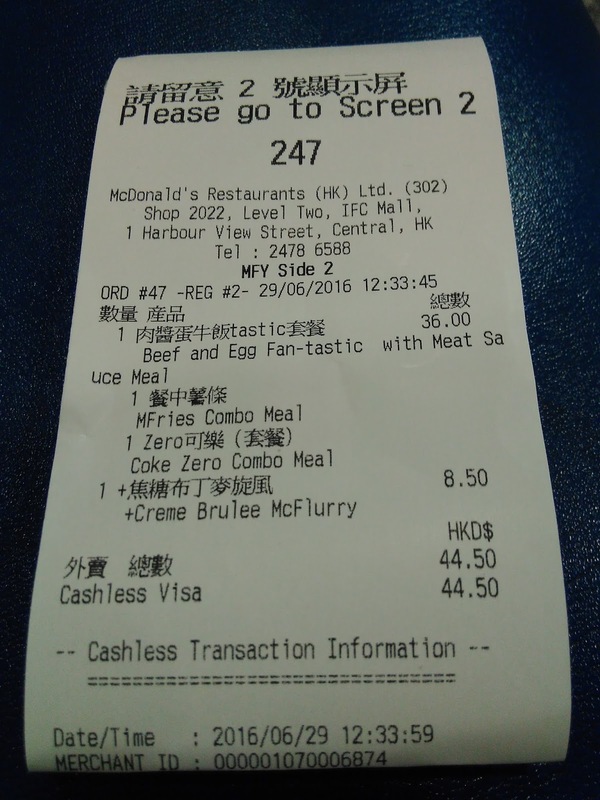 This time McDonald's Hong Kong was selling 2 different rice bunned burgers, the Beef & Egg Fan-Tastic with 'Meat Sauce' which this review will cover, and the slightly easier to say "Chicken & Egg Fan-Tastic" . 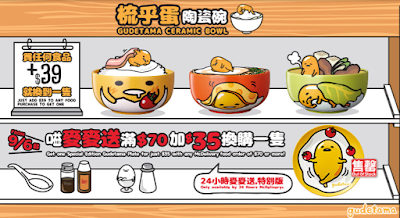 Unlike most of South East Asia which is running Angry Birds tie-in's McDonald's Hong Kong is being branded with the Japanese character Gudetama. Hong Kong usually has some pretty cool packaging, and the box which surrounded this burger was no different. 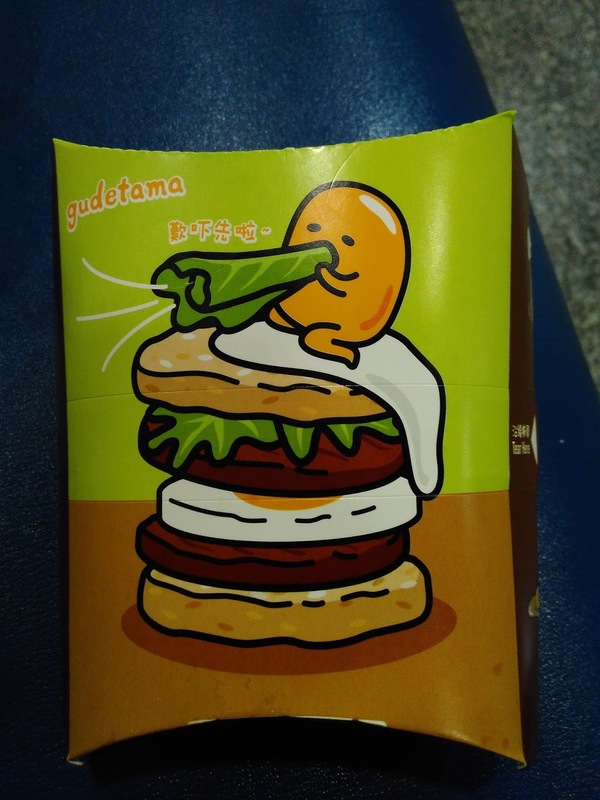 Since the Gudetama character is an egg, that meant all promo items would contained an egg of some kind (I'll show the other items at the end of this review), but what really stood out to me for this burger was the rice bun more so than the egg. 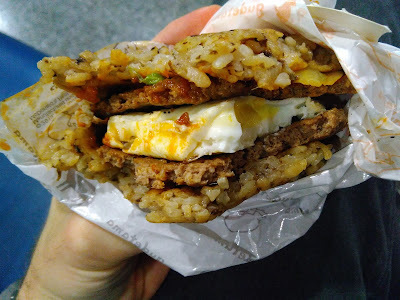 Although rice buns used to be a regular menu item in Taiwan, they have since been removed from the menu and now only appear as a limited time offering so I haven't been able to write a proper review about one. Now, I'm sure many of you are wondering how rice can be compressed into something that wouldn't fall apart and keep everything else safely inside. 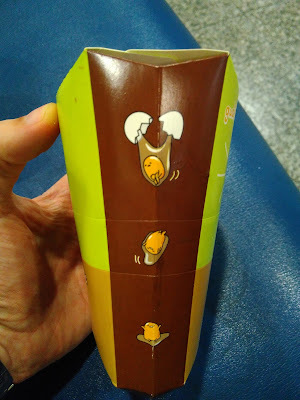 In fact, if you bend it enough, the bun will break and fall apart and it also needs to be wrapped tightly with a plastic sleeve in order not to simply crumble after every bite. That said, the bun was chewy and if you are careful, it will stay together pretty nicely, but those last couple of bites are always the hardest and I've failed every time I've eaten one. You can tell from the colour that the rice has it clearly seasoned before being shaped, and that's also what give it the stickiness required to stay together. The bun was salty, so there's no surprise that soy sauce was a key ingredient, but I suspect there was also vinegar (possibly Mirin) and maybe a touch of oil as well. In an attempt to give it some flavour there was also veg and herbs spread throughout the rice. Most looked like dry green vegetables, possibly spring onion, there were a few corn kernels too (probably only 2-3 per bun), but there might have also been dried mushroom flakes in there as well. 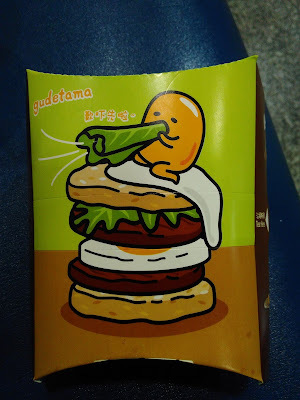 Thankfully they didn't really add much to the flavour of the burger, and to be completely honest, I felt the bun was a bit underwhelming all said and done. 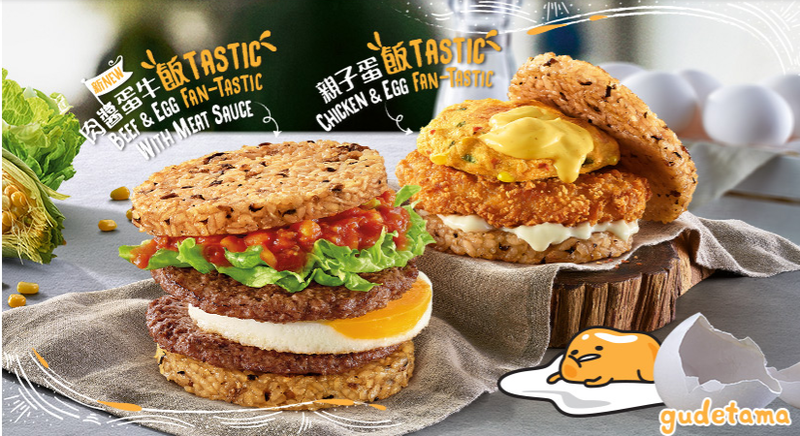 Between the rice buns there were 2-Big Mac patties flanking a fried egg. I suspect the egg was only in there to fulfil the Gudetama egguirements, and it since the rice was already not that flavourful, the egg just added unnecessary bulk to the already hefty burger. 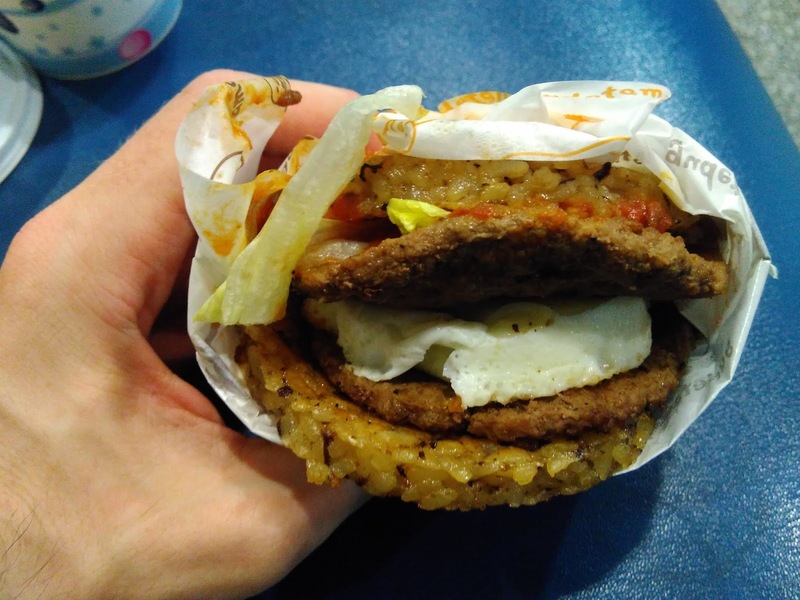 Speaking of the weight, each of the individual rice buns weighed more than a small burger on it's own, so this single sandwich had the weight and feel 3X a typical McDonald's Burger which made it one very filling burger. Being full after a burger was a nice change as I usually am still pretty hungry after my reviews. The real star however was the "Meat Sauce", but I truly wish the could have come up with a better name for it as it just sounds so bland...The Meat Sauce was actually a zesty, almost salsa-like chunky tomato sauce which also had some ground beef mixed in for good measure. In many countries they would have served this sauce on a burger and called it a promo of it's own, and it probably would have held up too. 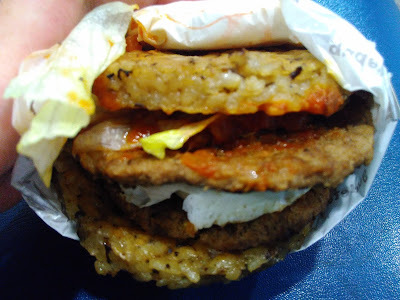 The sauce was mixed together with the lettuce, and that gave it a balance which the rest of the chewy burger was missing. It was only served on a single side, and I would have happily lost the egg in the centre for an extra serving of sauce on the bottom bun. It was significantly better than the similar Demi Glace sauce I tried from Japan and that's probably the closest comparison I can make to anything else I've reviewed. 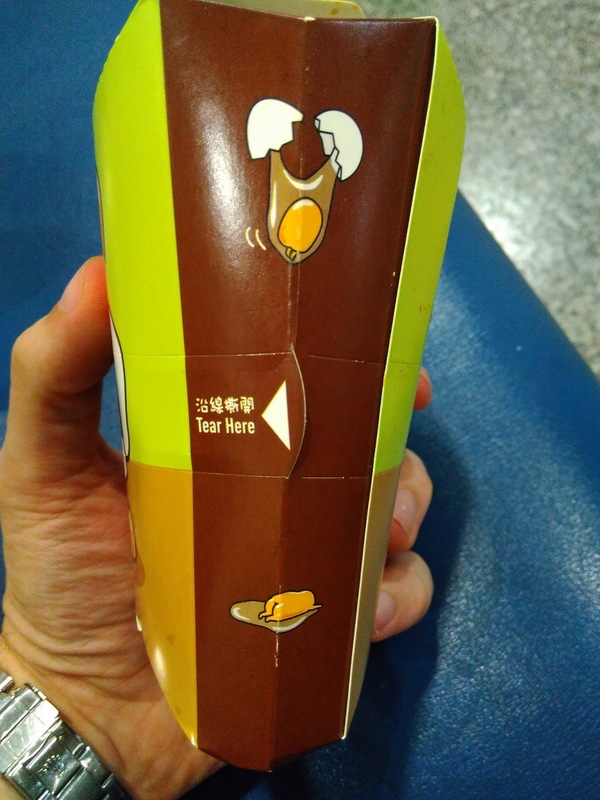 The bigger surprise was that the sauce wasn't all that salty, which is very surprising for fast food. The soy sauce in the rice and the salt on the patty already made this burger pretty salty, so the lack of salt in the meat sauce was a welcome reprieve. I've thought pretty hard about the score I would be giving this burger as I'm pretty conflicted. There were a few things I really enjoyed about this burger as well as a few things I didn't. 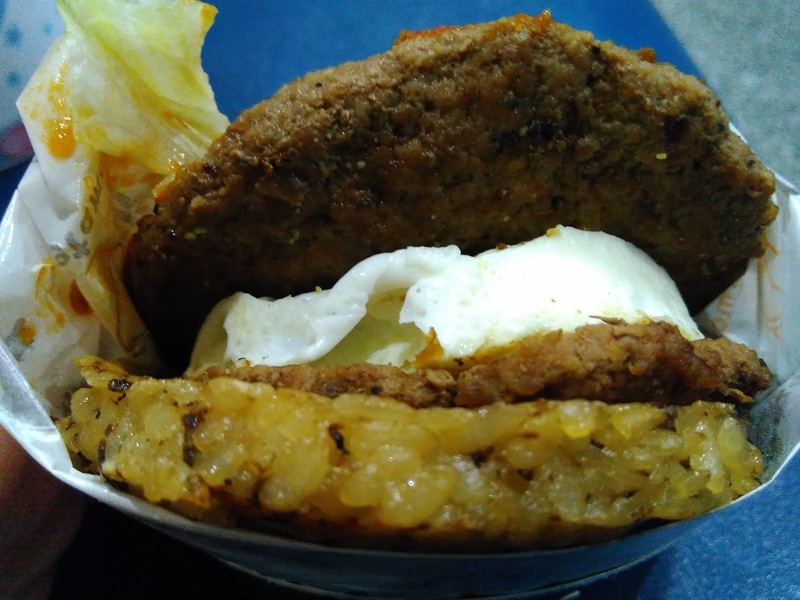 In the end I probably disliked a more things than I liked, but in the end, this is exactly the kind of burger I like to hunt down and review. 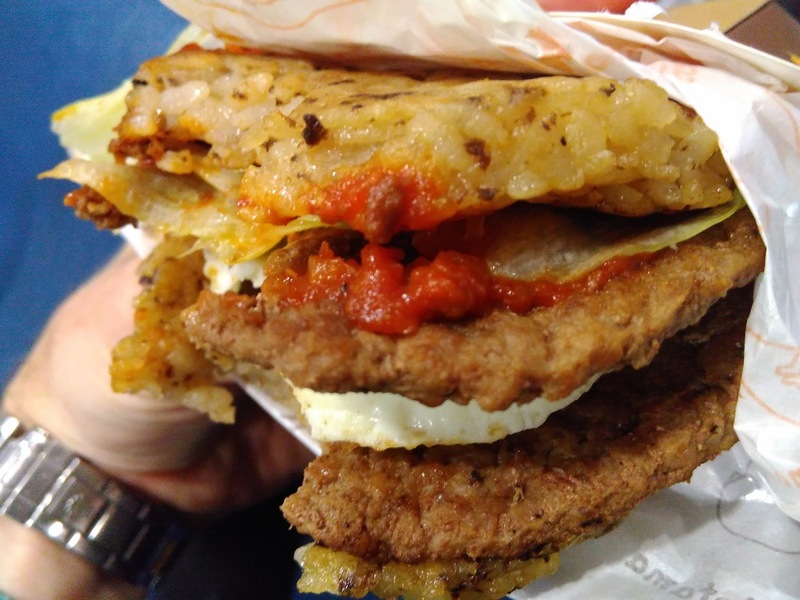 It's unique, and it pushes the boundaries for typical McDonald's fare. Sure, it wasn't amazing and I wouldn't order one again, but I those things I didn't like about it weren't really bad they just weren't great. So despite being not the best tasting burger in the world, it's still going to get an above average score. The McCafe side of the restaurant also had a range of Gudetama items as well. 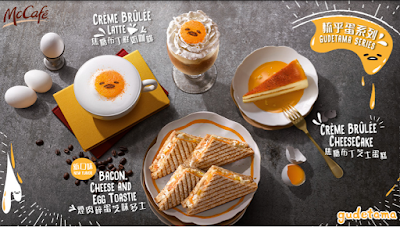 The Creme Brulee Latte looks cool. 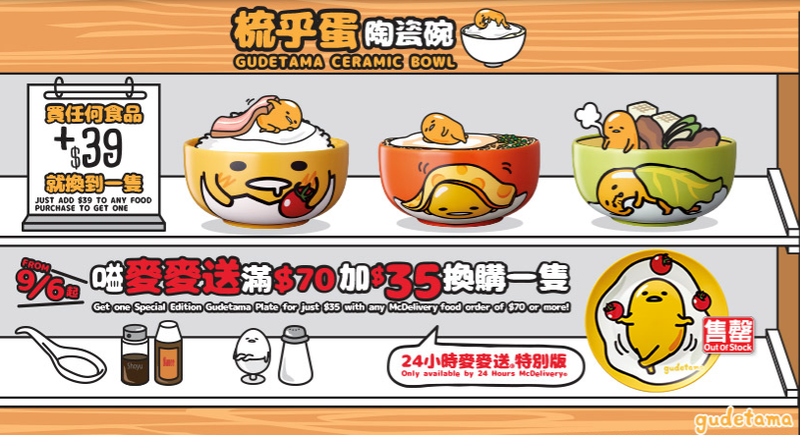 They also sold ceramic Gudetama bowls for $39HKD ($5USD) with any food purchase. To be honest, i don't like the idea with sushi and burger remix version.